Prior to today, I had mistakenly thought that the M201 Bayou exclusive that recently sold out from Fountain Pen Hospital was to be a one off type of release. 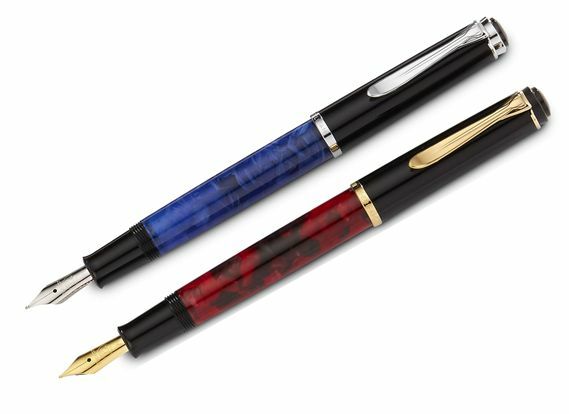 Imagine my surprise then upon awakening this morning to an email from Fahrney’s Pens out of Washington D.C. announcing not one but two new M201 fountain pens exclusive to their establishment. We now have the M201 Neptune Blue and Mars Red. Like the Bayou, each pen will be limited to just 100 pieces. The Neptune is described as having, “swirling, cosmic cloud-like patterns” while the Mars is “marbled with dark tones like a luminous nova in deep space.” The cap, section, and piston knob will be solid black for both pens. Interestingly, the trim will vary with the Neptune seeing silver-colored furniture while the Mars will have gold-colored furniture. The nibs will be stainless steel available in sizes EF, F, M, B, and Italic. Like the Bayou, the barrels will have some translucency to allow for viewing the remaining ink level in the pen. One of the fun things about working at Fahrney’s is those days when one of our vendor partners comes in with a pocketful of one-of-a-kind resin samples and says, “Would you like to have an exclusive”? Generally the response is a resounding “Yes”! Based on that description then, Pelikan seems to be shopping around resin samples and offering established vendors an opportunity at an exclusive. Fahrney’s Pens has been a well-known retailer in the D.C. area for 85 years now and has an excellent reputation. It would make sense that these might be samples since the production runs have been limited to just 100 pieces each. The M201 Neptune Blue will be sure to cause issues for pen collectors in the future as its chromium trim would traditionally have classified it as an M205. The only other M200 that was released with chromium trim was the Deutsche Telekom special edition released in 1994. Now it appears the Neptune will share the same exact furniture of an M205 but carry the M201 designation. The Mars Red will have the standard gold furniture of the M2xx line and include a crown cap top that has an all-black colored trim, just like the Bayou. We again have an italic nib option but this is limited to a non-plated finish only. Given that fact, if you’re interested in the italic nib, it would seem best suited to the Neptune Blue model. The list price for the M201 Neptune and Mars is $200 and Fahrney’s Pens is offering them at $170 each for nib sizes EF, F, M, and B. If you want an italic medium on either pen, the price will jump to $182. This is not significantly different from the company’s standard M200 retail pricing. These pens are listed as in stock and appear to be ready to ship. The Bayou sold out in just three weeks so if you are really interested in one of these, I would encourage you not to wait. I’m not sure what Pelikan is up to here or how many more of these releases we can expect. I would like to get a closer look at these pens as I haven’t quite been able to make up my mind about the finishes just from the provided pictures. If you missed out on the Bayou and are looking for something different from Pelikan’s Classic line, this may be your second chance. What this will serve to do is make it very hard in the future for collectors to complete a collection of M2xx pens. Click the link below to be taken directly to Fahrney’s Pens website. Those are absolutely gorgeous! Just from the photos you have provided Joshua, I think I like the Mars Red better than the Neptune Blue. I think I too favor the Mars Red just a touch more myself but will reserve judgement until I see them in person. Those were my first sentiments this morning as well. The Blue of the Neptune reminds me of the M800 Blue o’blue. I can see the comparison. I can’t tell for sure from the available pictures though how much of a match it is for the M800. We’ll see once they’re in hand. Dang! I like the FPN Bayou edition much better, but didn’t have the funds then. I wonder if there are more mini-editions in the works. That’s the million dollar question. I thought the Bayou was going to be a one off but obviously I was wrong. We now have 3 limited run pens. I have a feeling this is not the last we’ll hear of the matter but which retailer will be next? I can’t imagine Mottishaw wouldn’t be given a crack at this opportunity… Binder too, were he still in the pen-selling biz. I have a hard time believing this is the end of these little jewels. Right now, I’m pleased I hadn’t jumped on the Amethyst. I’m not sure what Pelikan’s criteria are for approaching vendors but I’m sure it likely has to do with sales volume. I just hope they put the breaks on for a while so the coffers can fill back up. 2015 has been a crazy and full year for Pelikan releases. Yep, I suspect there will be some European dealers that get to jump on this train as well. It’s instant profit for the retailers. I agree that it would be nice to see Pelikan take a little hiatus on these releases. Wait until Spring 2016 at the least. Mottishaw normally only sells pens with gold nibs. Perhaps an exception would be made for an exclusive LE. Pelikan is putting out some heavy volume on the limited edition front this year. Time to call the bank manager I think. Very heavy volume. I love this year’s releases, don’t get me wrong, but I think I have more than enough 2015 pens to carry me we’ll into next year. Mine arrived. The Blue is definitely a match to the M800 BoB and the red matches the M620 Madrid. Transparency of the red is better than the blue by a bit. After seeing them both, I prefer the blue, though I thought it would be the other way around. Very pleased, and the three M201s together are a stunning trio. I agree that they do make a very nice trio. I find it interesting that the Neptune Blue came tagged as an M205. Certainly fits the trim but goes against the M201 nomenclature from Fahrney’s. I haven’t decided which of the two I prefer but think it might be the Mars Red. I noticed that too. Also reinforces the fact that the crown nut is plated instead of black on the Neptune. That is true, they are for the U.S. only just like the Bayou. The way these are coming out though, I wouldn’t be surprised to see a release for the international market. I just purchased among the last available while in DC the other day. I got the Mars Red and it is absolutely beautiful. I was surprised these have lingered as long as they have. The Bayou sold out relatively quickly compared to these. Congrats on your new pen!